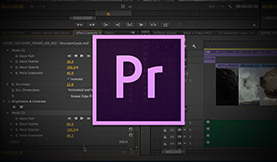 These Premiere Pro project tips will get you up to speed with the interface and have you working more efficiently. New to video editing in Premiere Pro? In this post we look at some basics to help you get your bearings. In the project panel, you can work in either icon or list view. You can click on the icons in the project to switch views, or I suggest learning the shortcut Shift + \. When I want to look at the structure of a project I use list view. 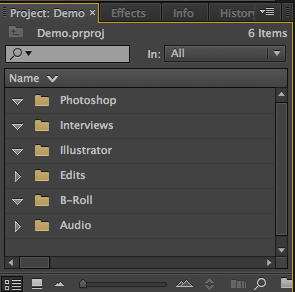 Folders are called bins in Premiere Pro, which may be a bit confusing (as they are called folders in After Effects). Bins are imperative for keeping your project organized, without them your project will quickly become messy. 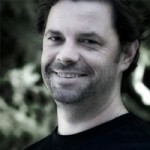 Check this post on getting organized and use the free project’s bin structure as a starting point. Create a bin by clicking on the “New Bin” button. Be aware that if a bin is selected when you do this, you are creating a bin within a bin. You can search for footage by name by typing in the find box search window. This is useful if you’re working with a mass of footage – but the footage must be organized for the search to be effective. You can also search for Faces by clicking on the magnifying glass. 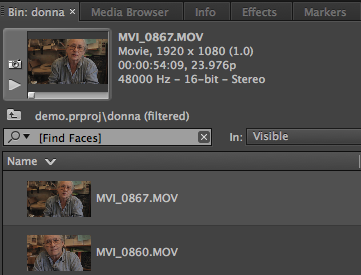 For this to work, you have to analyze the clips for Face Detection. This feature is VERY handy when working with a lot of interview footage. Select the clips, right click and select “Analyze Content”. Choose “Face Detection” and click Ok. 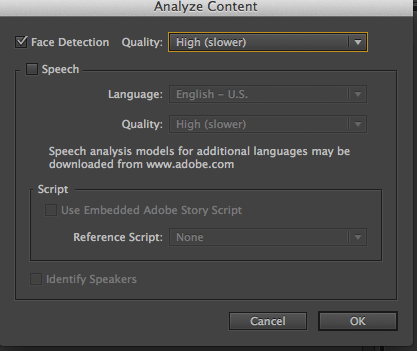 This will launch Adobe Media Encoder, which does the actual analysis. When it’s done, you can filter clips based on Faces. There is also a a magnifying glass at the bottom of the project. Use this for more detailed searches, as you can locate assets by criteria you specify. 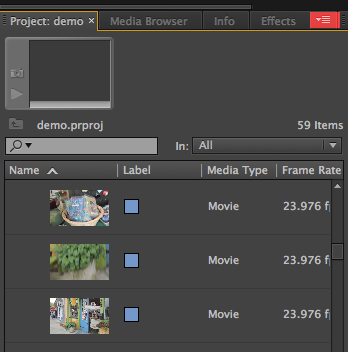 Clicking on “New Item” lets you create a variety of items in your Premiere Pro project. The ones I use the most are sequence, adjustment layer, title and color matte. 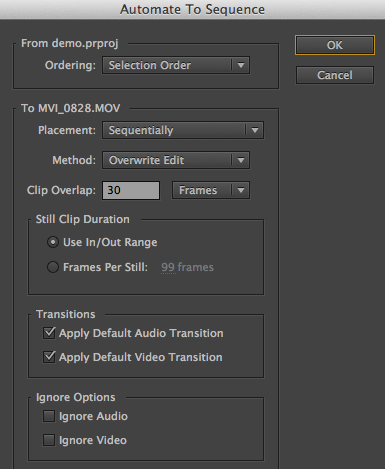 Most of these are self explanatory, but the Premiere Pro Help covers what each of the options does. In list view you have the option to view thumbnails and the preview area. You select these from the project pulldown. Personally I like seeing both of these. You can change the thumbnail size by dragging the zoom slider at the bottom of the project. 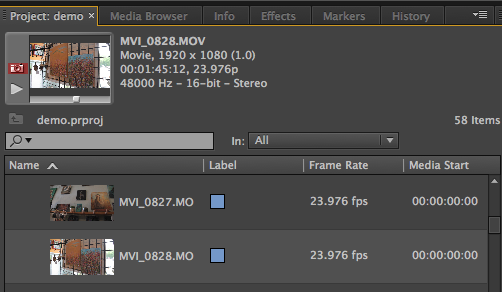 With a clip selected, the preview area lists info about the clip (format, duration, pixel aspect ratio, audio). Click the play button in the preview area to play the clip, and click the camera icon to change the poster frame (the identifying frame for each clip). 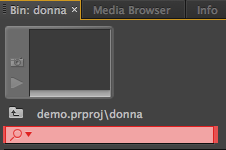 The preview area also tells you a clip has been used in a sequence. 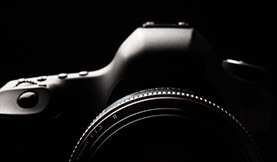 Click the clip usage icon to see what sequence it is in and navigate to it. This is extremely helpful when you’re working with tons of short interview clips. Click on any column to sort by that column. Click, hold and drag to change the order of the columns. By default there are a lot of columns visible, and you may be overwhelmed by the amount of information displayed. You can customize what columns are visible in list view. I generally customize what columns are visible based on what kind of project I am working on (narrative, doc, music video). 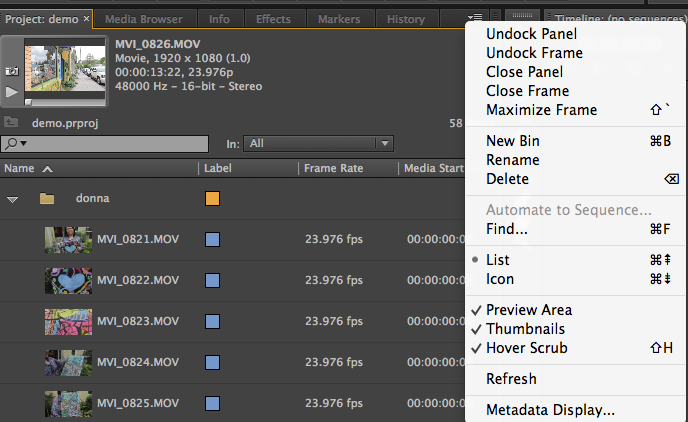 One of the big advantages of using the icon view in Premiere Pro is hover scrub. Put your cursor over an icon and the clip will play backwards or forwards as you drag your mouse. If you click on the clip a yellow bar appears (shows the in & out points) and a playhead. You can drag the playhead, or use the J,K or L shortcuts to play the clip. You can set in & out with I & O. If video clips have audio, there is a a white waveform icon to show that the clip contains linked audio. 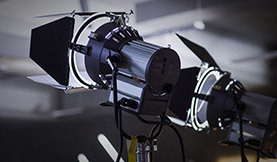 Once the video/audio are used in a sequence an orange icon will appear. By clicking on the icon you’ll be directed sequence. In Icon View, you can sort by clicking on sort icons button and choose from the list of options. You can quickly edit clips into a sequence using “Automate to Sequence ” It also works in list view, but it is more useful in icon view. 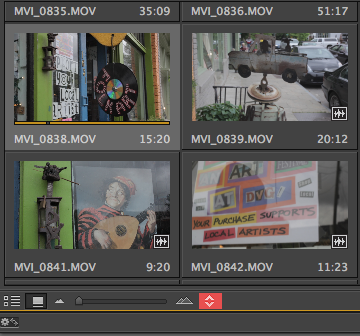 The most useful workflow for Automate to Sequence is to set in/out for all the clips you want to edit into a sequence. 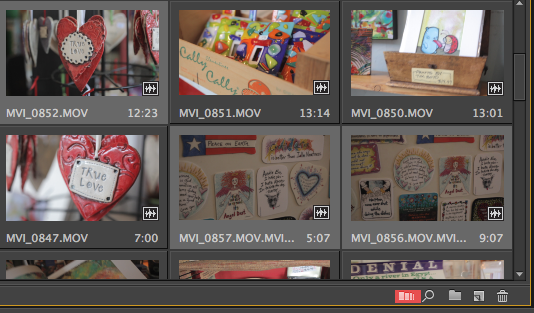 Then select the clips in the order you want them to appear in the sequence and click “Automate to Sequence”. You have the options of applying a default Transition, and ignoring either the audio or video. You can also use markers with Automate to Sequence which is covered here. I hope these pointers will be useful in giving your a jumpstart in editing your videos with Premiere Pro.